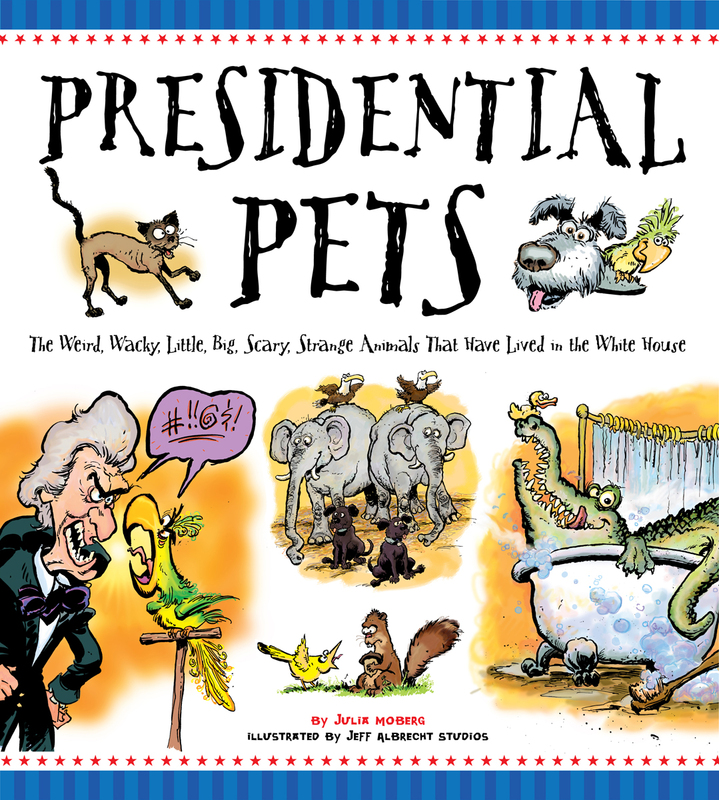 We had so much fun reading through a review copy of Presidential Pets by Julie Moberg. Initially, because of the caricaturish drawing style, I didn’t think my kids would like it; they are much more into more child-friendly drawings. I was wrong. Both my three and my five-year-old laughed at the silly drawings, asked questions about why an alligator was in the bathtub, and I think they actually learned a lot about animals and our presidents from the text. Veggie parents should be aware that the book does not soften some of the realities of pet ownership. There is mention of Zachary Taylor’s horse having his tail hairs plucked clean as souvenirs, and several pets end up in the zoo after misbehaving. The majority of the pages are about beloved pets as devoted companions. We used the different situations to talk about how we treat and respect animals. The illustrations by Jeff Albrecht Studios and the text by Julie Moberg are both aimed at ages 8 and up, but younger children can appreciate the rhymes, if not all of the presidential facts. Parents, at least this one, can also learn new things about our presidents as well. Has there been a presidential cat since Socks? And we’ve all heard about presidential hopeful Mitt Romney’s dog Seamus (who’s now dead) – anyone know what his family’s horses are named, or if they have other companion animals?